After unveiling Lumia 1020 that sported a mammoth 41 mega pixel rear camera; and Lumia 625, its largest Lumia device in terms of screen size, Finnish handset giant Nokia has now officially launched the successor of Lumia 920 in the Indian market. 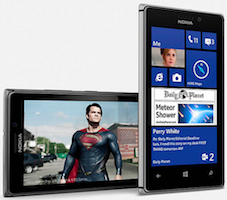 The device, called Lumia 925, sports a 4.5 inch display screen (same size as its predecessor) and runs on the Windows Phone 8 operating system. While the company has launched the device for Rs 34,169, you can get your hands on it for over Rs 1,500 less (Rs 32,499 to be exact) from a number of e-commerce sites. Here is a look at the specifications of the device. The smartphone has a 4.5 inch AMOLED capacitive touchscreen display (768x1280 pixel resolution) with 332 ppi pixel density, and runs on the Windows Phone 8 operating system. It is powered by a 1.5GHz dual core Qualcomm Snapdragon S4 processor and has 1GB of RAM. The internal memory of the device is 16GB, which is non-expandable. On the camera front, the device has an 8.7 megapixel autofocus rear camera with dual-LED flash that can record full high definition videos (1080p) at 30 frames per second and a front facing 1.3MP camera that can also record HD videos (720p) at 30 frames per second. In terms of connectivity, the device comes with Bluetooth 3.0, Wi-Fi, 3G and 4G (depending on the region), and it also has a microUSB port but no microSD card slot. The camera is the highlight of the device (in fact the tagline of the smartphone is 'more than your eyes can see') and according to Nokia, with PureView technology, Carl Zeiss optics and six physical lenses, Lumia 925 provides sharpness in low-light photos and video and its Smart Camera mode (for burst photography) allows users to create action sequences and more. In addition, the Nokia Pro Camera makes capturing images easier than ever. Users can adjust focus, shutter speed, white balance and more with intuitive controls. The device measures 129 mm x 70.6 mm x 8.5 mm and its weight is 139 gm. The company has provided a 2,000 mAh lithium ion battery that it claims will provide over 18 hours of talk time and 440 hours of stand-by time. It has GPS with A-GPS support and comes with an FM radio. The smartphone is available in black, white and grey colours. It will also come with Nokia HERE maps, HERE Drive (for car) and HERE Transit (for public transport). While the specifications of the device are decent, we feel that it has been overpriced by the company. An under Rs 30,000 pricing would have been ideal for Lumia 925. In terms of competition, in the price range, it will compete with the likes of Sony Xperia ZL (Rs32,999), Samsung Galaxy S4 (Rs 33,999), HTC One X (Rs 34,999) and BlackBerry Z10 (Rs 35,999).